Get Max Phantom F6 Specifications, Installation Manual & Product Comparison pdfs by clicking the download buttons. Or, use the accordians and tabs below to read about features and specifications without leaving this page. This super fast, low profile gate operator duo measures an astonishing 15.5 inches to the top of their swing arm caps, making it the lowest profile gate operator system on the market. The Phantom F6 can be hidden behind shrubs or landscaping to help architects keep the focus off the operators and on the gates. The Phantom F6 dual swing gate operator package is also compatible with existing installations and in most cases can be directly bolted onto concrete pads used by the most popular gate operators in the industry. This area is white space. This area is white space.This area is white space.This area is white space.This area is white space. This super fast, low profile gate operator duo measures an astonishing 15.5 inches to the top of their swing arm caps, making it the lowest profile gate operator system on the market. The Phantom F6 can be hidden behind shrubs or landscaping to help architects keep the focus off the operators and on the gates. The Phantom F6 dual swing gate operator package is also compatible with existing installations and in most cases can be directly bolted onto concrete pads used by the most popular gate operators in the industry. Corrosion control is not the most exciting topic, but can make all the difference when manufacturing an outdoor product. All gate operators are exposed to harsh climates. Temperature, moisture, and proximity to salt water will speed the rate of corrosion and compromise the structure. To guard against this corrosion, the Phantom 2000’s chassis is treated with two layers of protection. First the steel is coated with gold zinc, then, an electrostatic powder coating is applied. The cold rolled steel frame, which will not fracture under stress, is designed to withstand tremendous amounts of torque. 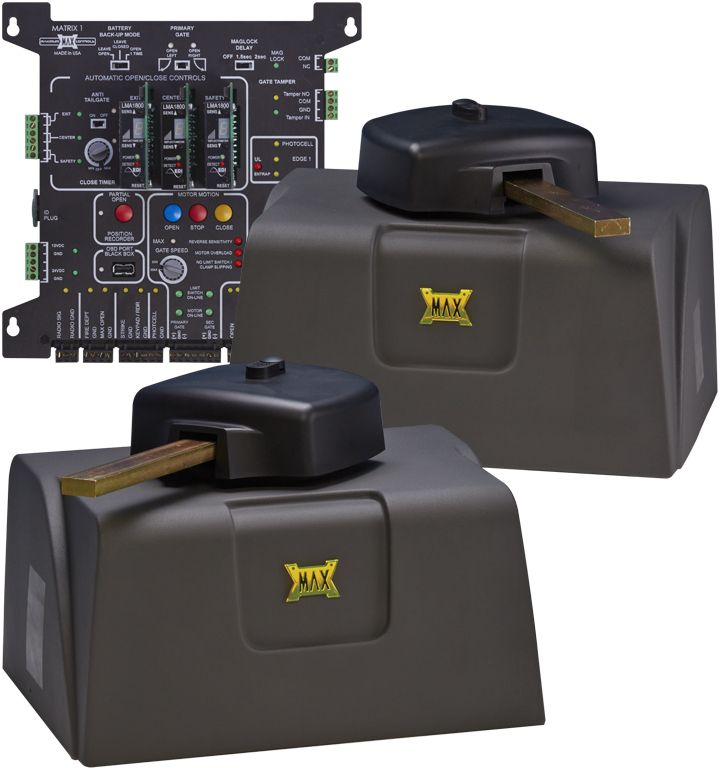 The Phantom F6 uses interchangeable modules that are functional in any Maximum Controls gate operator. Modules such as motor controllers, logic boards, limit boxes, and even battery boxes can be swapped from one operator to another regardless of the gate operator model number. This standardization of modules and interchangeability, coupled with the intelligence of our operating system offers a benchmark to which future gate operators will strive to achieve. The Phantom F6 implements a size 80, 500:1 high efficiency gearbox. This 500:1 ratio produces maximum torque, utilizes low amperage, and provides super silent operation. The rugged cast iron housing, bronze gears, and double sealed heat treated solid shafts have been designed by a team with over 40 years of experience in the gearbox industry. High speed ball bearings and a synthetic oil bath keep the dual gear reduction operating flawlessly through extreme temperature ranges. We invite you to compare our Maximum Controls gearboxes to any of those used by other manufacturers in the industry. Each Phantom F6 operator package has a motor controller. Maximum Controls proprietary motor control technology learns the physical characteristics of a gate in order to control motion with maximum efficiency and speed. The adaptive motor control of the Phantom F6 also facilitates precision synchronization of two gates that might not be of equal weight or length. In addition to communicating with two motor controllers, a single Matrix 1 logic board allows for variable speed control within learned speed parameters. The motor controller, using DSP technology, monitors all currents and voltages enabling 16 programmable levels of electronic obstruction sensing. The brushless DC motor in the Phantom F6 uses “Hall Effect” magnetic sensing to identify over five thousand precise rotational positions during 90 degrees of gate movement. That’s over 50 samples per degree of gate travel. Using this positional feedback, intelligent ramp-up and ramp-down of the gate speed is employed to minimize undue stress on all mechanical components. Utilizing the monitoring and updating of positional data, a solid sync of two gates can be realized. This constant updating is also used to detect any unauthorized movement. The 24VDC operating voltage of the brushless DC motor permits operation via a remote power supply. In this “low voltage mode,” the Max PS-24 power supply can be located up to 1000 feet away making installation far less costly and easier than traditional 120V AC trenching. Direct gear drive means there are no pulleys, belts, or chains required. Pulleys, belts, and chains are historic weak points of gate operators and require frequent service and maintenance calls. The Phantom F6 has a 3.25 inch solid steel output shaft. This shaft along with heavy duty cast iron clamps provide the necessary clamping force to move the heaviest gates while providing a braking mechanism if the gate is struck by a vehicle. The massive shaft clamp assembly requires no shear pins or plates that are damaged by unintentional impact. If a gate controlled by the Phantom F6 is struck, an intelligent reset system automatically recovers gate and limit positions. This means no costly maintenance or service fees. This serious clamp and output shaft design also makes the use of magnetic locks unnecessary. If any access is denied because of a system failure (remote control, keypad, or logic board/Matrix 1 malfunction) a manual system override is available in the form of a jog open/close switch. This jog switch, along with UL reset button, is located on the external control cover and an additional switch added near the entry keypad will ensure you are never locked out due to system failure. The Phantom F6 provides a quick and easy means to release any gate without compromising security. The lockable swing arm cap protects from unauthorized release of the gate arm. Once the cap is removed, the arm is easily released by pulling up the quick release handle. A key benefit of the Phantom F6 modular design is the ability to separate modules. The power supply module, for example, can be removed from the main chassis and installed up to 1000 feet away from the operator. Regardless of whether the battery is installed or the Max PS-24 is remote, the gate remains fully operational (the battery module is used only for backup operation). This feature can save thousands of dollars in trenching and costly permit fees. Unforeseen complications like rock formations or utility lines that have to be trenched around can be avoided by using a power management system that does not rely on battery power. As a result, the battery life is not compromised. The Max PS-24 is designed for extended life in extreme temperatures. These technologies are unique to only Maximum Controls products. In addition, operation of the Phantom F6 can save on energy costs. The average AC operator in a high traffic environment can cost as much as $700 a year. A similar facility using the Phantom F6 can save as much as 85% on the gate energy cost. The Phantom F6 battery module, the Max BC-7, contains many features necessary for gate operation during power outages and provides safe, smart trickle charging to keep the batteries ready for emergencies or overnight in off grid use. In addition to serving as backup power during emergencies, the BC-7 contains the electronics to properly integrate a solar panel into an off grid configuration. Yes, the BC-7 supplies an on-board solar regulator as standard equipment. Starting with the Max BC-7 front plate, a three LED gas gauge showing the current battery status—full, half, or empty is provided. This gauge also moves sequentially to indicate that the batteries are currently charging. A battery test status button, when pressed, gives you the actual condition of the batteries. Are the batteries a go or no go? No guess work here. You will know when the batteries must be replaced. When an outage does occur, an audible beep can be switched on to indicate battery backup in use. On the Matrix 1 board there are three modes of battery backup functionality. “Leave gate open” will continue to open and close the gate until the battery is near empty and leave the gate in the open position. “Leave gate closed” will continue to open and close the gate until the battery is near empty, then leave the gate closed. “Open one time” will leave a gate in the open position immediately if an outage occurs. Regardless of the battery backup mode, enough energy is left in the batteries to open the gate for an emergency vehicle. In an off grid configuration, in addition to the solar regulator, the Max BC-7’s solar processing circuitry provides a power boost, maximizes energy harvest, and keeps a tight grip on the load control ensuring the up to 200 watt solar panel is manipulated to its potential. Maximum Controls operators work with 80 watt panels or greater depending on the specific application. Standard 200 watt panels are supported and recommended. The solar in on the BC-7 requires 24 to 35VDC. Each Max BC-7 battery module is fitted with Yuasa batteries with an operational temperature range of -4 to 165F. These batteries offer high-energy density, sealed leak proof construction, excellent performance in float of cyclic applications, maintenance free, rechargeable, and long service life. When used with the Max Phantom F6 they offer 400 cycles of duty before discharge. One of the primary goals of the Phantom F6 is to provide a secure easily maintained gate operator with higher gate speed motion and advanced loop management. The Phantom F6 uses non-volatile memory to continuously log performance characteristics and input/output events. A service technician can access this data via USB port to download the event history, quickly diagnosing complex or intermittent problems that have been very difficult to isolate and repair in the past. A thumb drive plugged into the USB, with all history downloaded, acts as a “Black Box” to find out what happened. The Phantom F6’s event history is stored as a .TXT document which can be emailed to the factory for, if necessary, on site diagnosis. The .TXT file is a log of the most recent 1000 events reported by each module to the central logger. The Phantom F6’s standard intuitive loop management system, when enabled, will discourage tailgating and increase security for residential and high traffic installations. When the Anti-Tailgate switch is activated, any car tailgating a legitimate access will be forced to stop by a rapidly closing gate, forcing the tailgater to back up and thereby triggering the gate to close and deny unauthorized access. When disabled, loop management will allow multi access, with the gate opening on each successive trigger in the traditional loop management manner. As a security device, the Phantom F6 supplies a gate tamper relay output that triggers whenever a gate has encountered an unauthorized movement. This can be configured to activate an alarm and/or camera. The Phantom F6 also has a gate disable feature which can disable operator function during a vacation or overnight for commercial applications.